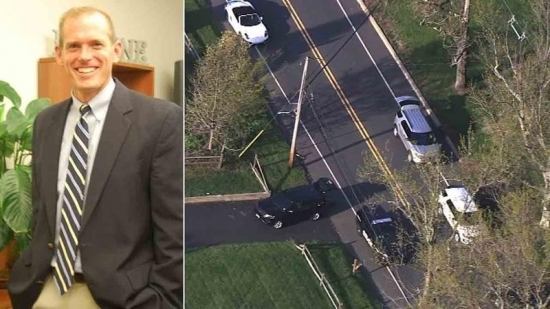 The Superintendent of Schools in Robbinsville, Mercer County, NJ, was struck and killed this morning by a 17-year-old high school student on her way to school. Dr. Steven J. Mayer was out jogging with his dog at 6:15 a.m. on Robbinsville Edinburg Road when he was hit. The female is a student at Robbinsville High School and was going to school early for a field trip. Both Mayer and his dog were killed. He usually runs every morning. All schools in the district were closed on Tuesday and will be closed again Wednesday. Hundreds attended a vigil held at 7pm Tuesday. Flowers can be placed at the gazebo at Foxmoor Community Park on Washington Boulevard. The accident is under investigation. There are no charges at this time. A judge postponed a hearing for a man charged with ambushing a Pennsylvania Police Barracks in Northeast Pennsylvania in 2014 after the media objected to being barred from a portion of the proceedings. 32-year-old Eric Frein is charged with killing Cpl. Bryon Dickson and seriously wounding Trooper Alex Douglass outside of the Blooming Grove barracks and then leading authorities on a 1 ½ month manhunt in the Poconos. Today, Frein's lawyers argued that his videotaped statements to police should be thrown out. Judge Gregory Chelak asked the media to leave the courtroom so he could review the tape. There were objections and the hearing was postponed. The judge will hear arguments on Thursday why the review should happened in open court. The Philadelphia Flyers released a statement following Monday night's 6-1 loss to the Washington Capitals in Game 3 of the playoffs. They addressed the 3rd Period incident where about 100 plastic bracelets were tossed onto the ice. “Flyers fans are the best in sports. However, last night, a number of individuals behaved in an unacceptable manner. Fans have the right to voice their displeasure vocally or by not watching or attending games, but when displeasure is expressed in a way that embarrasses or endangers others, it cannot be condoned or tolerated.